Bighead carp has Chinese origins and is widespread throughout Asia reaching as far afield as Europe and the USA. The Bighead Carp is native to the large river systems and flood plains of Eastern Asia with its range extending from Southern China to the Amur River which borders both Southern Russia and China. This highly distinctive member of the Cyprinidae (carps) family of fishes is easily distinguishable by its extremely large scaleless head and streamlined body which is adorned with a covering of minute scales. The Bighead Carp displays a marbled almost mottled brown to grey-green colouration throughout its body which is covered with blotches and has a huge cavernous mouth with a protruding lower jaw. Bighead Carp are equipped with large slightly under slung eyes which further accentuate the strange and ugly appearance of this Asian monster carp species. This Asian carp species feeds predominantly on zooplankton, detritus and other vegetable/ plant matter and is classed as a filter feeder. Bighead Carp have been legally introduced into various other countries most notably the USA to assist with the removal and consumption of undesirable plankton in water treatment plants and aquaculture facilities. Unfortunately, Bighead Carp have escaped into nearby rivers during flooding and have now become an established and highly invasive species threatening native freshwater fish populations in various river systems in the US. 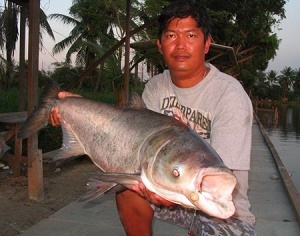 The Bighead Carp is present in various commercial fishing lakes, ponds and rivers in Thailand where it is regularly caught at weights to 25-30 lb. Bighead Carp are often caught on cereal based groundbaits whilst carp fishing in Thailand for Giant Siamese Carp and other Asian carp species.